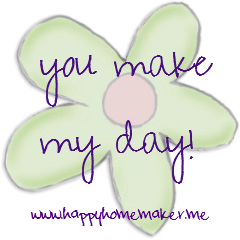 Happy Homemaker Me: Thanks for being part of the Happy Homemaker Community! Thanks for being part of the Happy Homemaker Community! I'm pretty much giddy to be back to blogging. I've missed all of you! I love the sweet comments you leave for me, and how you've invested in the life of my family. I'm grateful for you! I realized this morning, why am I keeping this wonderful community a secret? Why am I not sharing with everyone how awesome you all are? So, I'm thinking...will you join me in a community link up? I would love for all of you to get to know each other too, and help support each other's blogs and Facebook fan pages. I realized that there are many of you who have fan pages that I don't even know about! Will you link up with me? Please share your blog page and/or fan page below. Let's support each other! I set this linky up as a blog hop, so if you want to share it on your page, just copy/paste the code. The more, the merrier! Thanks for hosting a blog hop! I agree, the more the merrier. I know from my side it's hard to visit everyone's site, but do what I can when I can. Sometimes I have a "visit" day where I don't make a post, but visit the sites I've joined and comment on their posts - as a way to say thanks and to let them know I do visit. Thanks again!